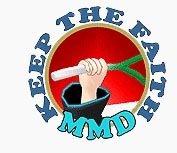 This little LearnMMD Project was fun to do … only 40-seconds long … and the lip-sync motion files are included in the download from the LearnMMD Downloads page. We are calling this a “project” rather than a “meme” because only the WAV file … and the lip-flapping motions … are included in your download zip. It is up to you to create the scene and to create your own animation motions. I wanted to show the lovers lying in the grass in a park-like setting. I chose one of the lawns featured in the MMD Batokin Island stage. My choice had its problems … mostly because of the slanted ground where I did my “shooting” … but, once I had the models placed and rotated to match the ground, I was ready to go. I searched and searched for a Len model that looked masculine, enough, and still looked to be close enough to the same species as my TDA Neru. 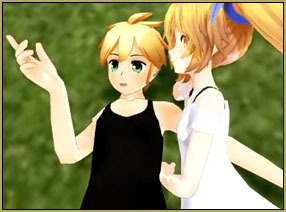 The TDA Len model had been created from a Miku base … and he DID look rather effeminate … maybe cuter than Neru! … so I settled upon another Citrusmoothie model, “f_tr Len”. This model was easy to download … no password needed. He had really clunky teeth which I was able to switch off. He almost lost the part because of his bad teeth! The highlight of my little animation is in the second verse where Len draws “a ring around the moon and a line from start to star.” I enjoy how both models follow Len’s hand through the motion … Watch the hands; I made use of my hand-pose collection to quickly roll the fingers from a sharp pointing gesture into a relaxed pose and back into a “point”… back and forth. Check out the Downloads Page to download my set of hand poses. They are a real shortcut in any animation! 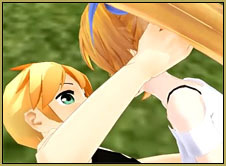 I added a couple of seconds of animation beyond the end of the music so as to allow Len to get close to Neru … I think this little bit adds a nice finish to the video.